In November 1993, concerned about unaffordable student numbers, HEFCE announced measures to ensure that the higher education participation rate was held steady over the three years from 1994/95 http://www.hefce.ac.uk/pubs/hefce/1994/c19_94.htm. This set a maximum allowable student number (MASN) for each university, including all home fee undergraduate and taught postgraduate students. These controls remained in effect remained in effect over the initial 3 year period and only ended in 2002, some 8 years later. 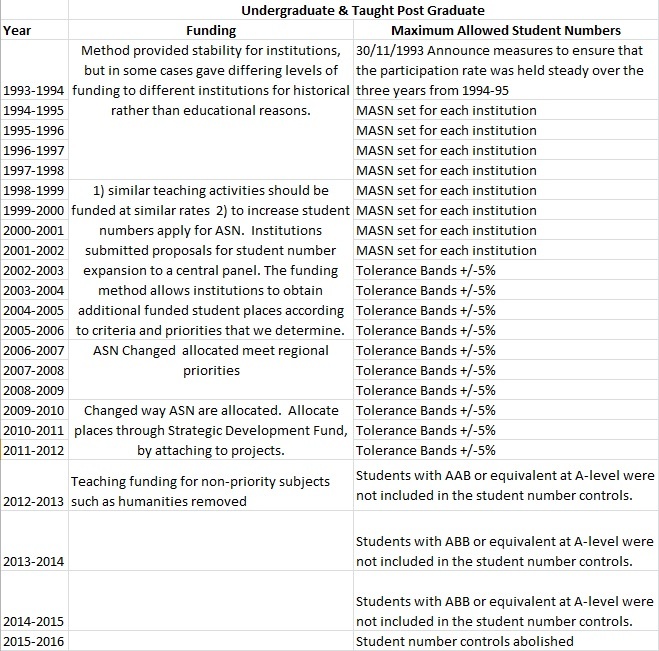 At this point tolerance limits were introduced which was intended to give universities slightly more control in their numbers – student numbers were limited to be 5% more or less than in the previous year, so that institutions seeking significant expansion could do so only by bidding successfully for fully funded additional places. Institutions were still subject to the requirement to remain within ±5 per cent. This means that there was a limit to which institutions could recruit students without securing additional grant, and institutions wishing to expand recruitment significantly could do so by bidding through our annual additional student number bidding exercises. This system was strictly enforced with universities faced with a fine should they over-recruit. This system remained in place until 2012/13, when the numbers cap was removed completely for students achieving at least AAB or equivalent in their A-level examinations. In 2013/14, the cap was removed for students achieving at least ABB or equivalent. The cap will be completely abolished in 2015/16.